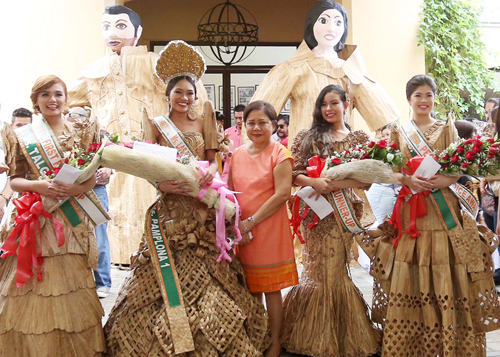 Sen. Cynthia A. Villar with the Miss Water Lily 2018 winners: Sen. Cynthia Villar poses with the winners of the Miss Water Lily Festival 2018 now on its 13th year. The winners are Arlyn Claire M. Sangab of Barangay Pamplona 1 who won the grand trophy and P20,000 cash; Rebecca Kirsten S. Lopez of Barangay. Talon 4, 1st runner-up who got P15,000 cash and Rojielen Angela Autencio of Barangay. Pulanglupa 1, 2nd runner-up who got P10,000 cash. Patricia Mariel R. V elasquez of Barangay Talon 3 bagged the People's choice award. The water lily festival is an annual celebration in Las Pinas to showcase the useful products out of the acquatic bloom.